App-developers can win a prize of 30.000 euros for the best app-idea that will help citizens, journalists and other interested people to follow the decision-making of five Dutch provinces. From the 1st of November people can participate in the Open Provincies App-Challenge and submit their app-idea. On the 12th of December a jury will choose the best idea. In March, before the provincial elections, the winning app will officially be launched. 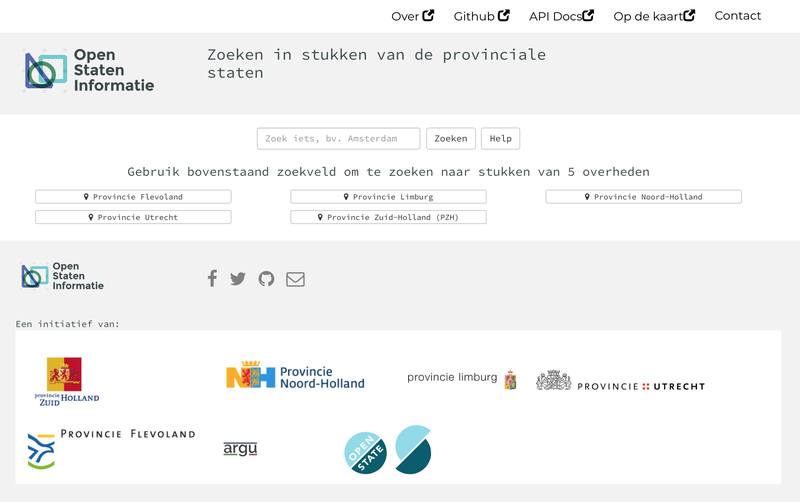 The Dutch provinces of Flevoland, Limburg, North-Holland, Utrecht and South-Holland have released the data of their States-Provincial as open data. These data hold bills, amendments, decisions and minutes. Citizens, journalists, members of the States-Provincial and anyone else can view this information via the Open Stateninformatie Search Engine. With the winning app the data of the five Provincial-Estates must be easier to follow. Now the information is available as open data, app-developers can use this information for new purposes. With the app-challenge the five provinces challenge developers to send in their ideas to make it easier to follow provincial decision-making for citizens, journalists and other interested people. The provincies have a development-budget of 30.000 euros available for the winner of the app-challenge to build to app. From the 1st of November app-developers can submit their ideas through the website challenge.openstateninformatie.nl. The deadline for submitting is the 9th of December. A professional jury will review all the submissions and choose a winner. The winning app will be launched just before the provincial elections in March 2019. Since the beginning of this year 108 municipalities release their council-data as open data in cooperation with the Association of Dutch Municipalities and Open State Foundation. For the municipal elections the website WaarOverheid.nl was build. This website places the council-data on a map of your neighborhood with the help of smart algorithms. From the Dutch National Action Plan on Open Government, that was launched on the 18th of October 2018, municipalities and provinces will cooperate to make their decision-making information available as open data. These governments are working together on standardizing the data and scaling up the project. In this way decision-making will be more transparant in the future and with the re-use of these data democracy can be strengthened. All information on the app-challenge can be found on the website challenge.openstateninformatie.nl. On Friday the 9th of November (from 13:00) a brainstorm session will be held in the city of Utrecht. During this session people that are interested can get more information on the app-challenge, the data-sources and there will be an inspirational workshop. There will be a brainstorm session and drinks afterwards to exchange ideas. You can already subscribe for this brainstorm session via this form. Open Stateninformatie and the app-challenge are an initiative of the Dutch provinces of Flevoland, Limburg, North-Holland, Utrecht, South-Holland and Open State Foundation, supported by the Interior Ministry. The Open Stateninformatie is searchable via: https://zoek.openstateninformatie.nl/, via this page more information can be found about re-using the open data to build your own app with the data. The Open Stateninformatie search-engine. The search-engine uses the data of the Provincial-Estates. Which (web)apps can you make with these open data?